Pastel colours are soothing and relaxing to the humans’ eyes. These candy-like hues add a fresh twist to interiors and create a soft, tranquil and inviting vibe. 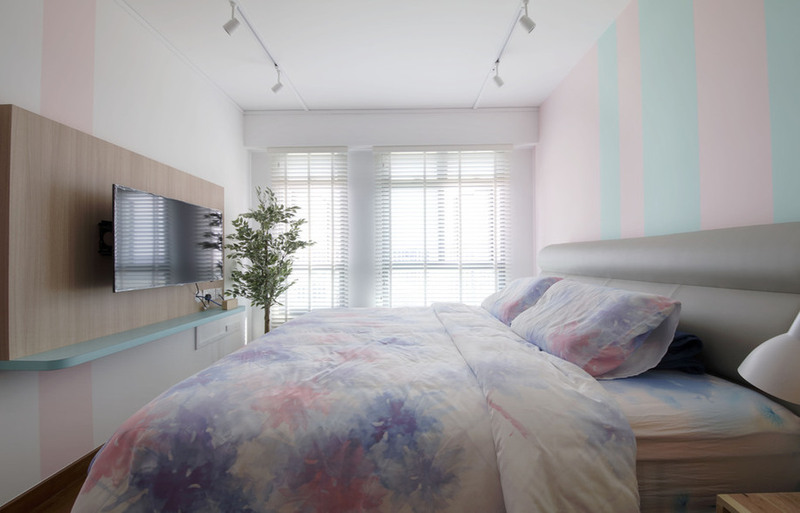 Rediscover the appeal of pastel through these three spectacular homes done by our laudable interior designers. 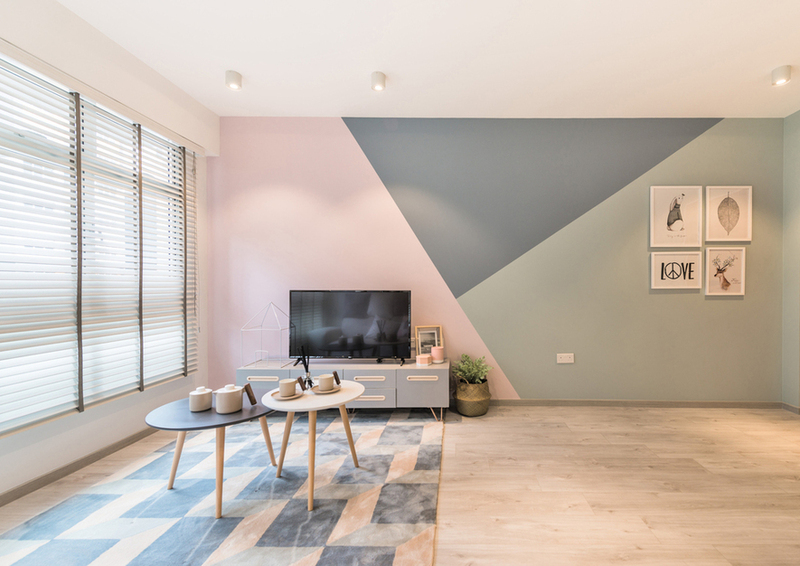 Awashed in several pastel hues, Mr Shopper Studio created a feature wall using clean, geometric lines. A sophisticated yet lighthearted atmosphere is created through the impeccable balance of the spaces and harmony of differing elements. 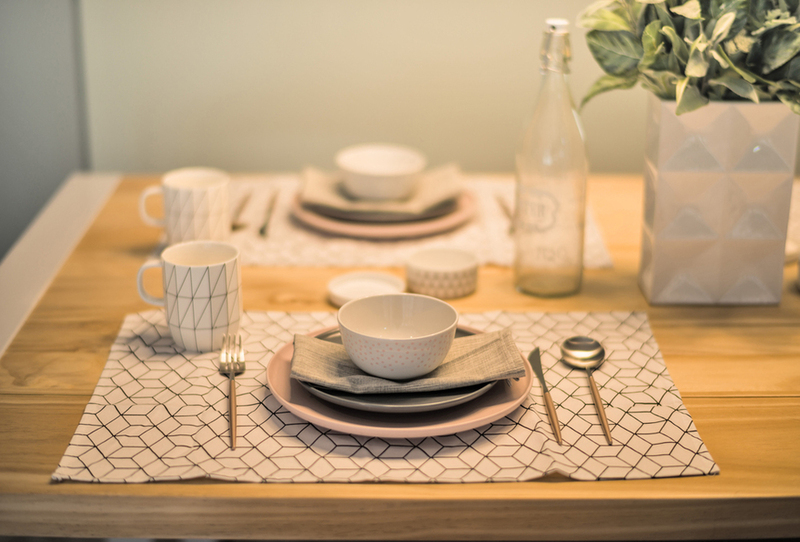 The contrast between modern graphic lines and soft, subtle colours creates a fresh and modern feel. The grey sofa blends in well with the wintery colour scheme and matching furniture as well as décor. Spots of pink is prominent everywhere and borrows the spotlight of the pink geometric feature wall. Repetitive angular patterns on the area rug also complements the wall through similar hues and intersecting corners. 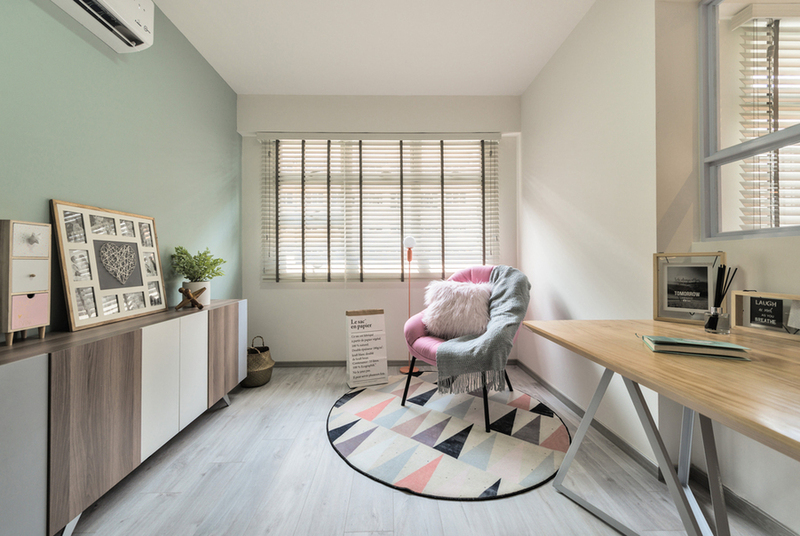 Neutral tones are adopted for the wooden flooring and surrounding furniture for the pastel hues to stand out. 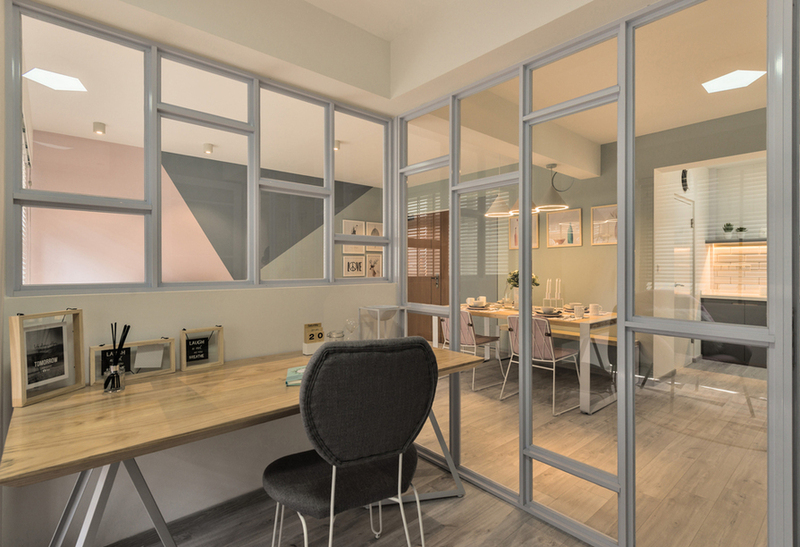 Differing sizes of rectangular glass partitions separate the study room from the communal space, giving the illusion of a bigger room and brighter home. 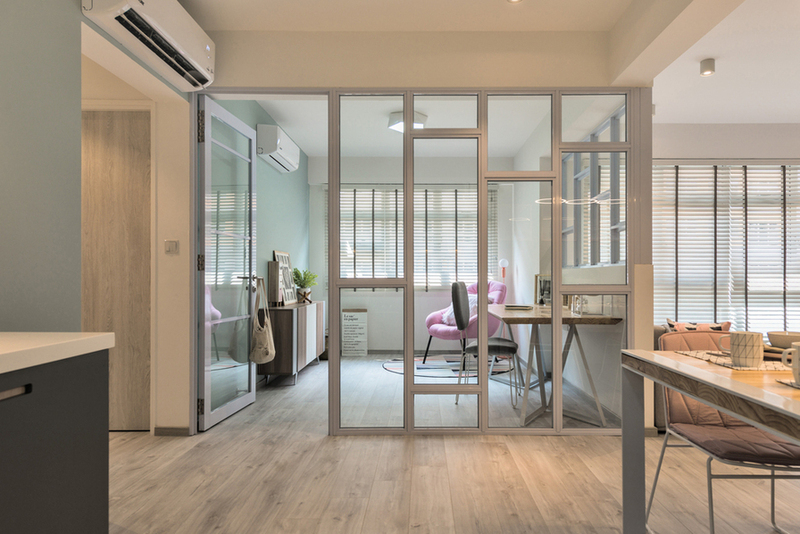 White frames line the partitions and contribute to the geometric interest that heightens the contemporary flair of the home. While angular lines are prominent, visual interest is created with circular-shaped lightings in the living and dining area. The contrast helps to balance out the space and lends the home lots of eye-catching elements with positive tension. 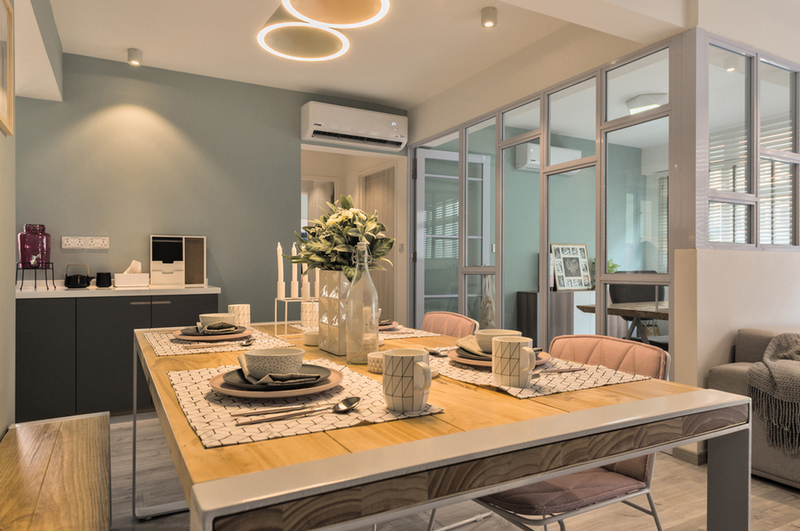 A two-toned wooden dining table is also fitted in the middle of the walkway, intentionally decorated with suitable dining ware and décor, focusing down to the minute details. Moving on to the kitchen, a grey white colour scheme is adopted. 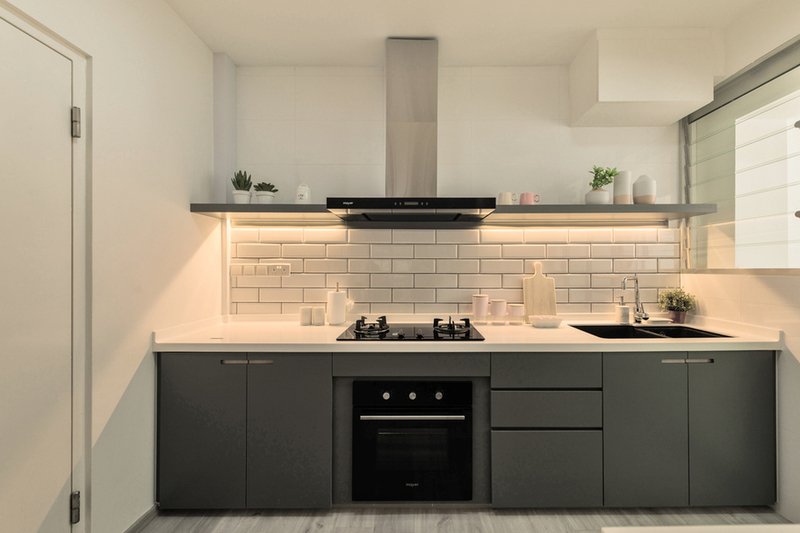 White subway tiles are used as backsplash for added texture, accompanied with sleek, matte cabinets that add a modern element to the interior. Draped in mint green, the wall sets the tone and direction for the design in the master bedroom. 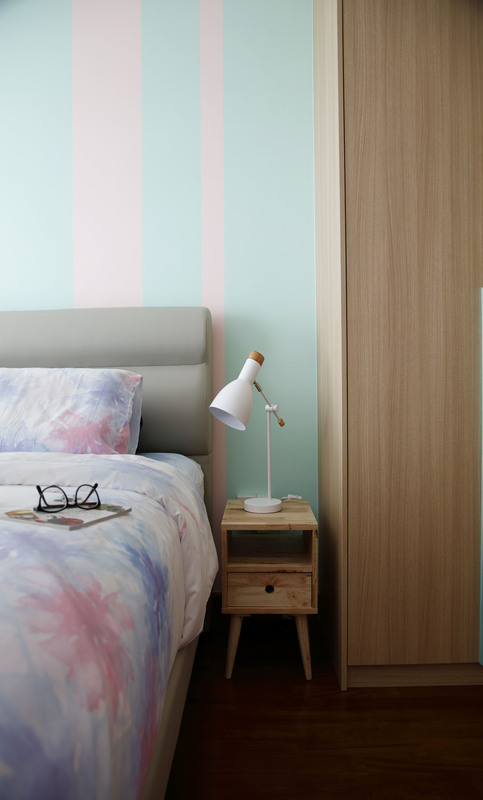 Pink is also heavily used – from the bedsheets to the bedside scone lighting. The geometric lines on the cabinet provides a visual continuity of the clean lines from the communal area. It also adds an interesting twist to the room and brings dynamism and added colour. A trio of art pieces stands atop of the headboard, fulfilling its position as a focal point in the room. 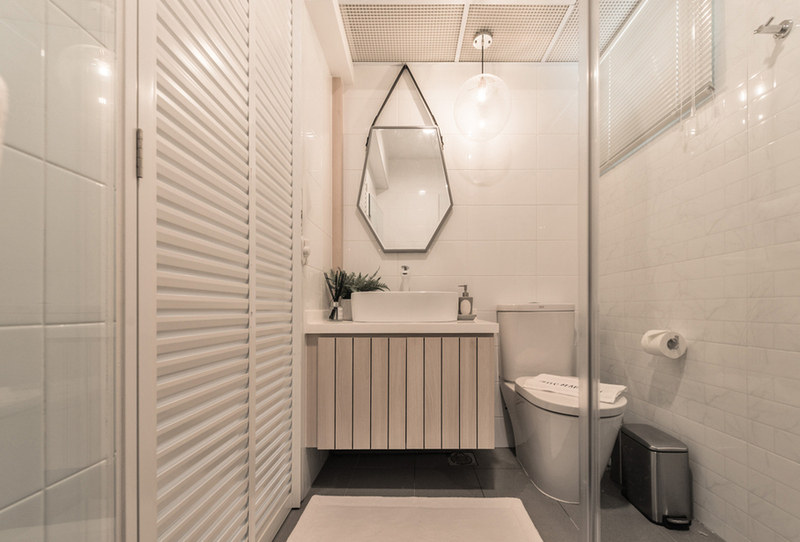 The white scheme of the bathroom keeps things clean, simple and calming. Details that add interest to the space include a geometric mirror and a pale wood cabinet (below the sink) is used. 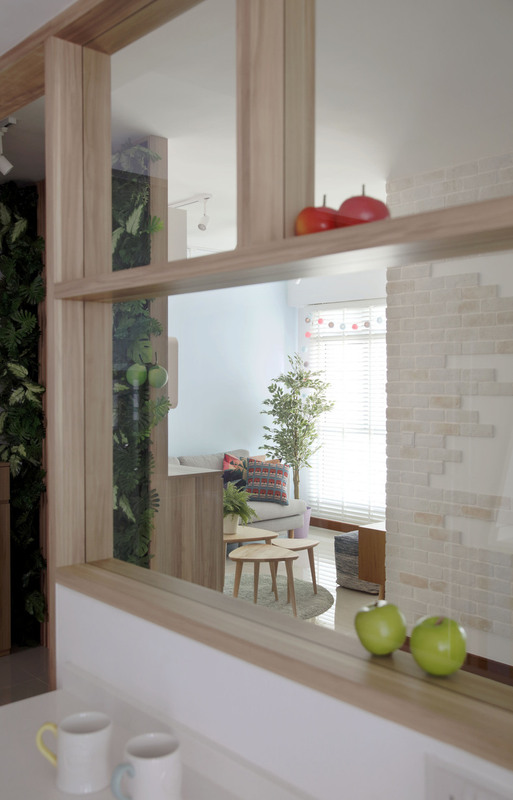 As you enter this home, you will first be greeted by soft-grained wooden panelling with foliage trimmings on both sides. A shoe cabinet of the same neutral undertone stands firm, showing a slight preview of vertical pastel stripes. 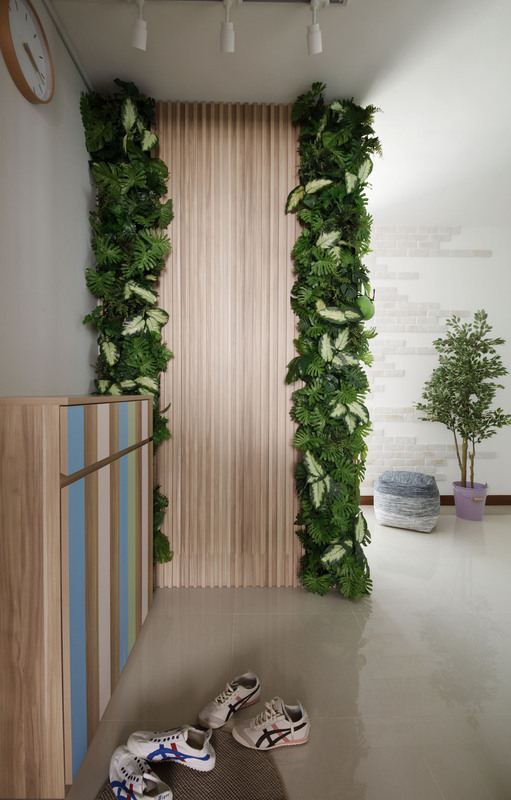 Presence of greenery adds a creative layer into the experience and resonated with the warm and welcoming atmosphere. 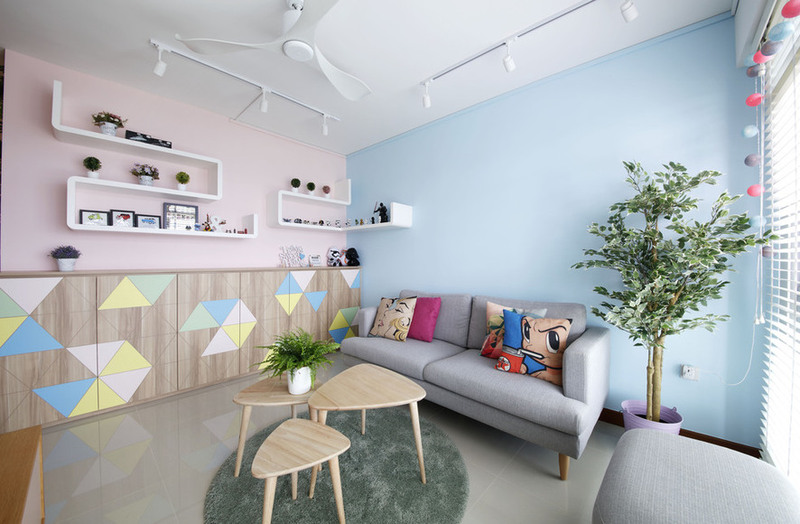 Venturing into the living space, Free Space Intent selected both baby pink and baby blue as the wall’s backdrop, reminding us of childhood dreams alike to cotton candies and skies. 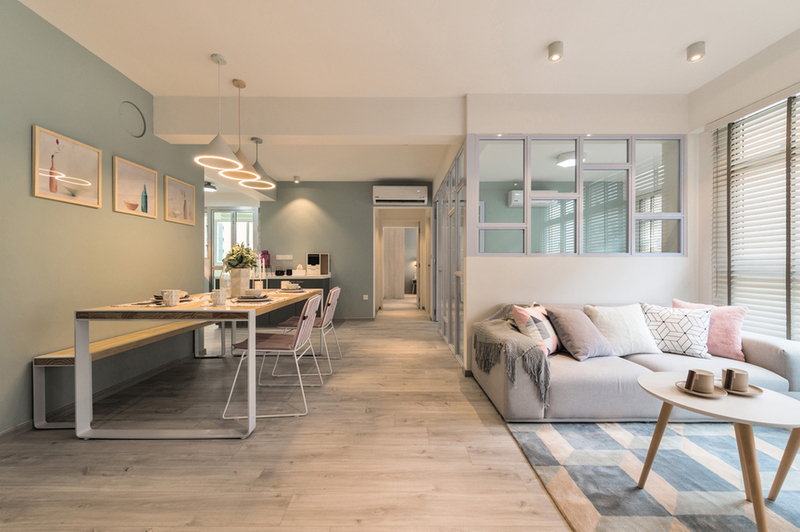 This unique combination to a home’s interior provides a fun ambience and sense of relaxation to the homeowners. 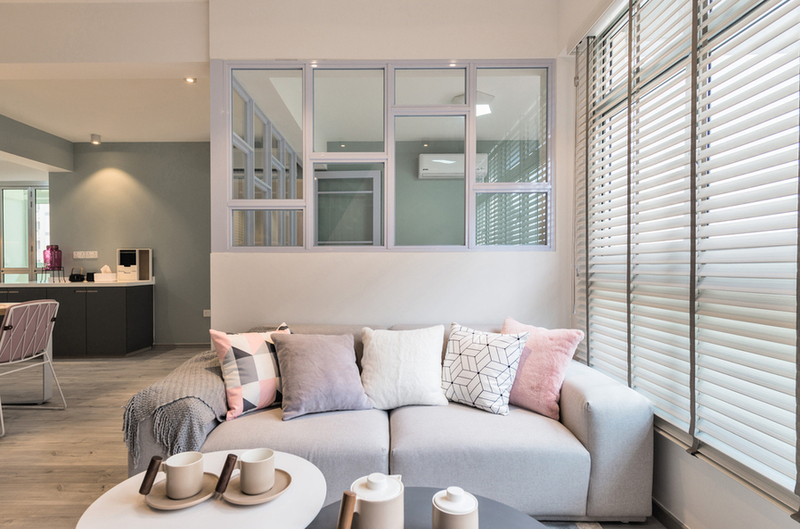 To ensure that the use of different light-coloured tones do not overwhelm the overall space, muted grey seating furniture and an area rug ensures that the interior stays grounded and increases its versatility to include other pastel elements and natural materials like wood. 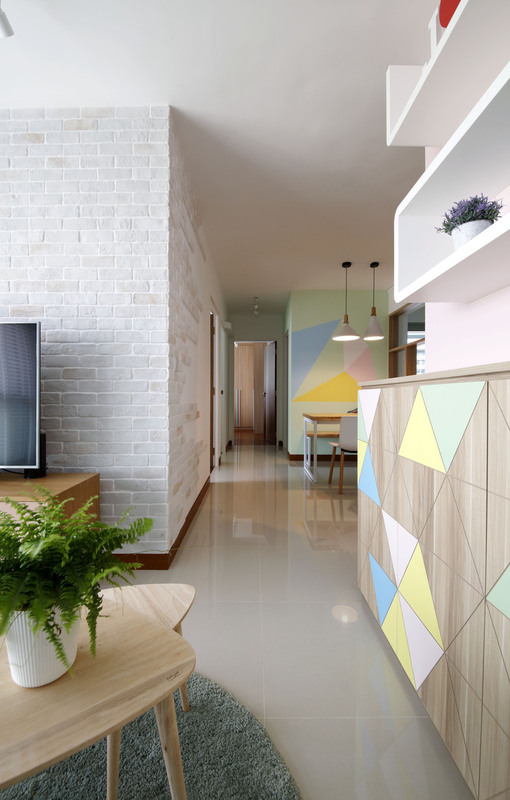 An off-white brick backsplash stands as the TV feature wall and extends out of the corners with irregularity to give the illusion of a longer wall while contributing as an interesting element to the pastel environment. Spicing up the space further, printed pillows with icons like Astro boy or Lichtenstein are mixed with bold hues of cobalt blue and fuchsia pink. Introducing daring colours into this soft interior adds a masculine touch without drifting off from the initial concept of the space. Certain pieces of furniture were also specifically designed to bring the whole space together. 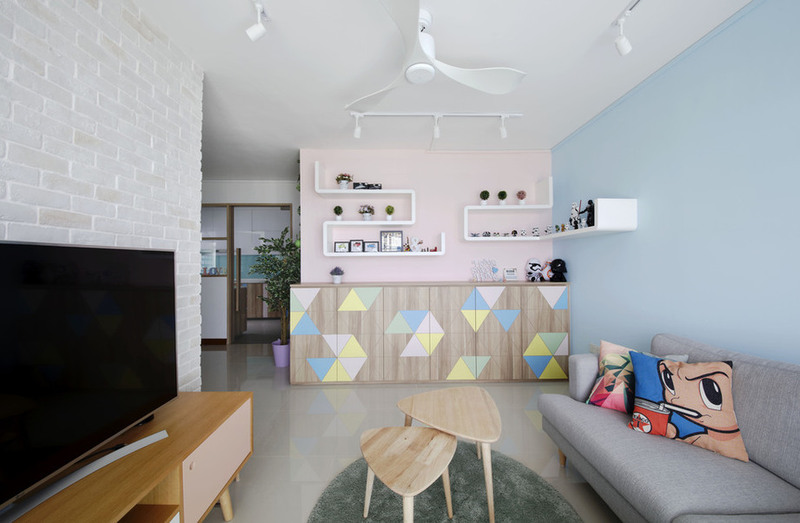 Sporting a fun and colourful geometric theme, the cabinetry in the living area boasts of colourful pastel triangles in repetitions. 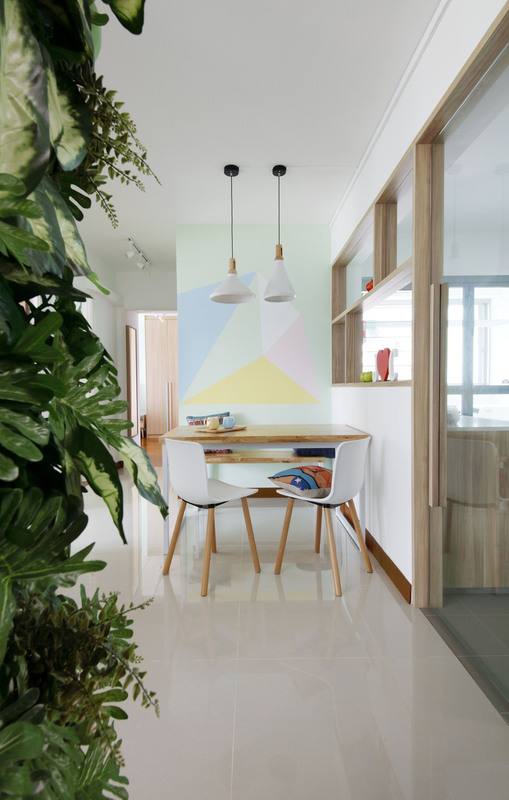 This geometric design and colour scheme is repeated over the pastel mint walls at the dining space. The kitchen’s cabinetry has the same vertical pastel stripes as the home’s foyer, ensuring that the same design language is kept consistent from start to finish. 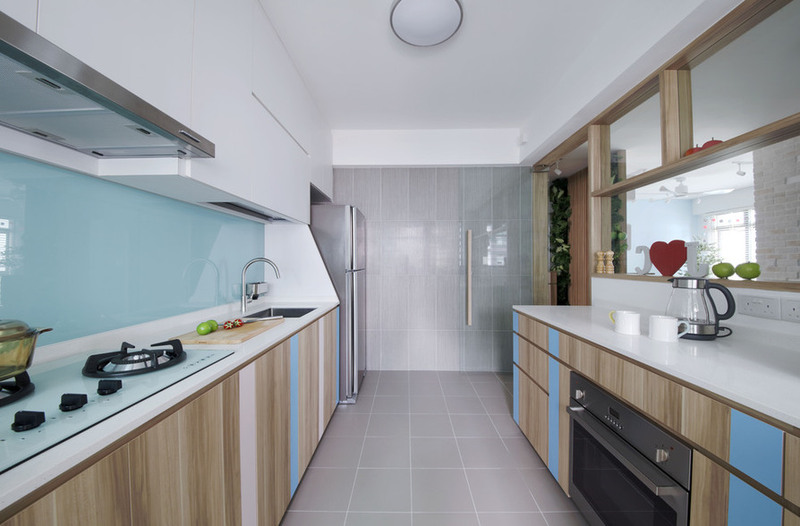 Combined with a blue backsplash and white interior, the kitchen has a lovely twist to it and does not feel overly feminine.. With ample storage space and a wide walkway, a airy and fresh space for cooking is created. 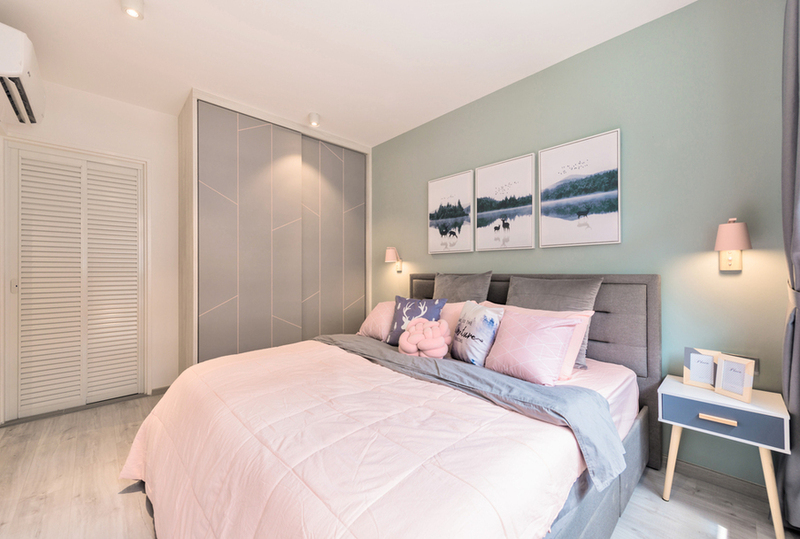 Similar shades of baby pink and baby blue are used in the bedroom. However, this time, the duo is presented in forms of uneven vertical stripes, creating the illusion of height. This feature conveys strength and stability, reshaping the home in an unconventionally modern way. To complete the design, pastel ombre sheets were used, with pastel purple thrown in to set a distinction from the living area. 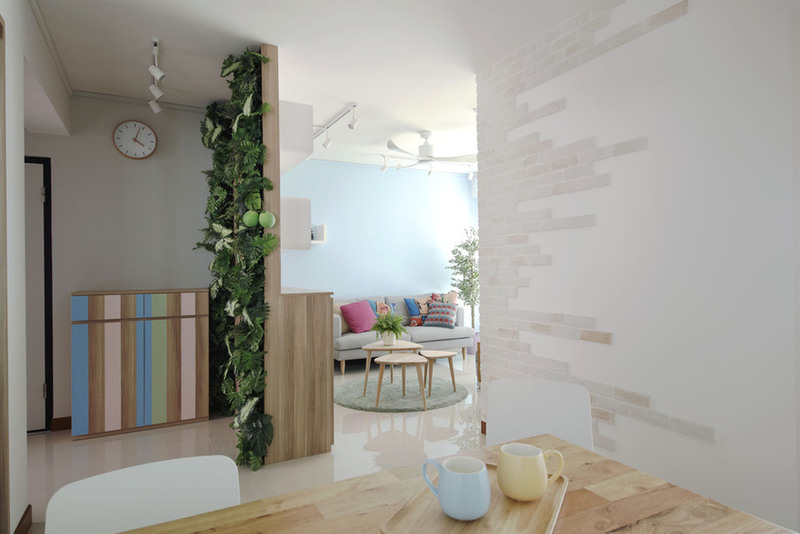 As each area possesses its individual personality, every part of the home is unique on its own while seemingly unified through the same design concept. 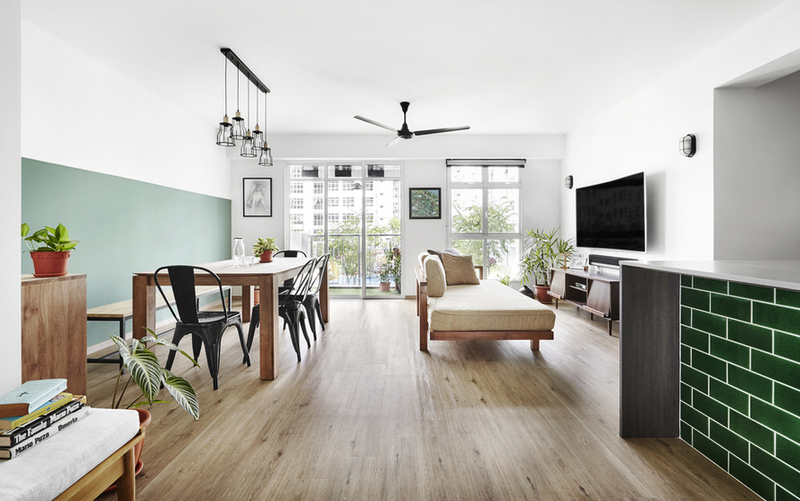 Situated in Compassvale Crescent, Third Ave ensured that the interior design of this apartment feels calm and soothing as main colours like blue, green and neutral tones were utilized. By painting a strip of cambridge blue on the wall, a clean line brings attention to the monochromatic paintings plastered on the two adjacent walls as well as the dining area. 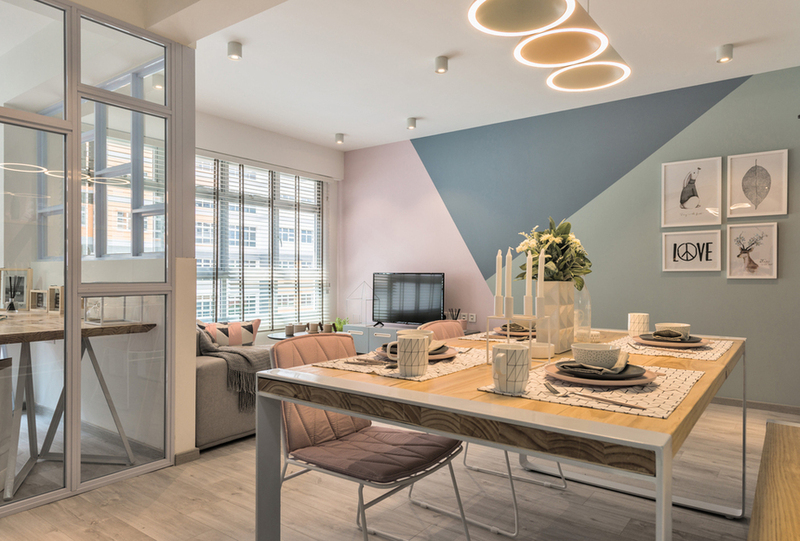 Having this half painted wall is also a great way to revamp the blank walls and add a visual punch to elevate the aesthetic quotient of the apartment. A black modern contemporary lighting hangs above the dining area and stands out against the white-cambridge blue walls, while complementing the black dining chairs. The repetition of the dark colour helps to bring about a sense of cohesion in this communal space. 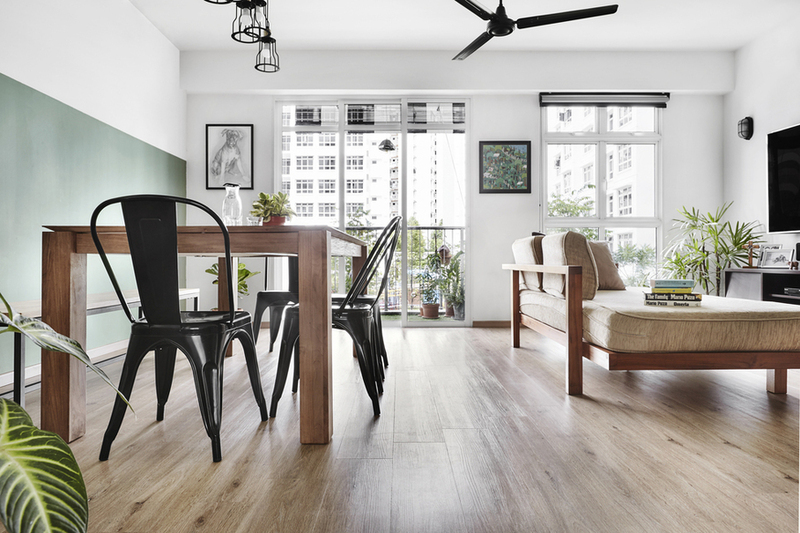 The wooden Scandinavian furniture and light wooden-grained flooring form a good contrast to the bold black furniture. With floor to ceiling windows against the crisp white background, copious amount of sunlight is able to pass through and brighten up the whole area. 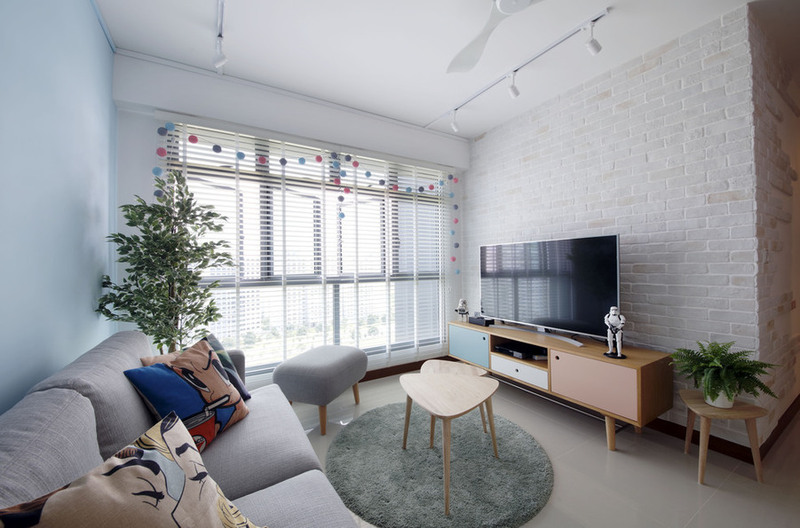 Natural lighting accentuates the clean, horizontal lines and cosiness of the apartment. Nothing embodies greenery like potted plants. Sprawling across the living and dining area, pops of lushness and serenity are added to the interior. 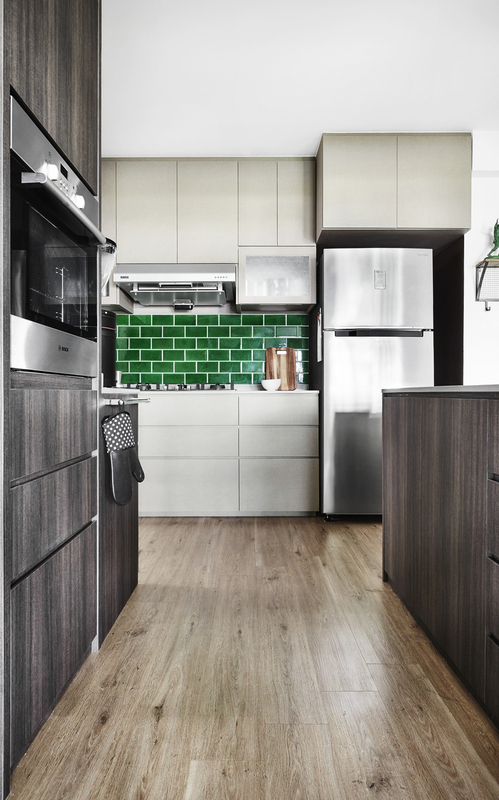 These green hues also ties in nicely with the emerald green subway tiles of the kitchen island. The richness in this greenery offers boldness and speaks to the desire of imparting vibrancy. 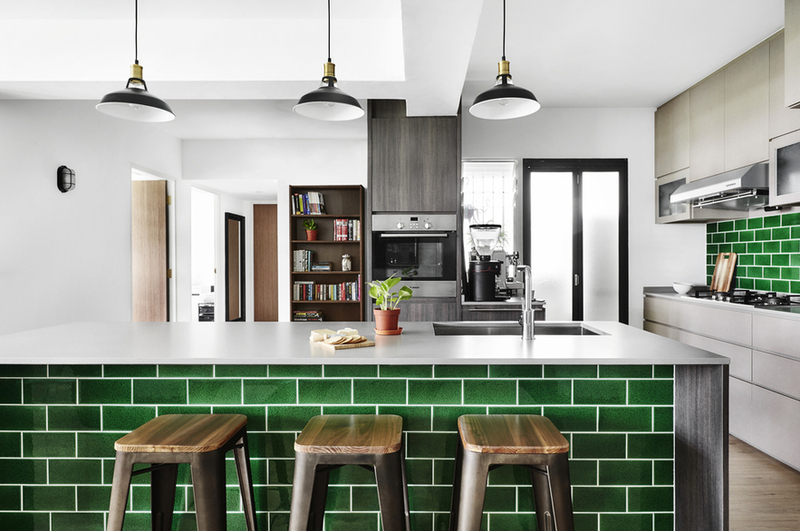 Apart from the neutral hues of the home, the daring usage of emerald green brings a luxurious and regal feeling, taking the interior up a notch. Coupled with the black accents, it brings an air of power and luxurious contrasts into the space. 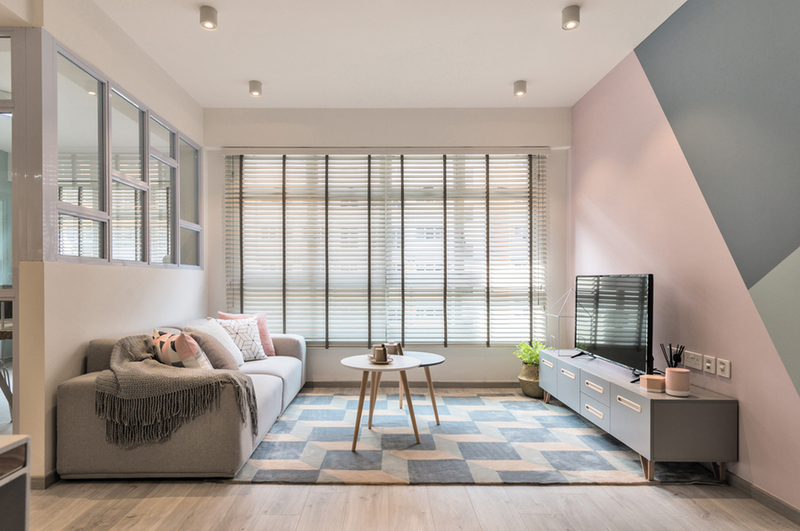 After viewing these 3 apartments, we hope you would have gotten rid of the stereotype that a “pastel home” simply means painting your walls in pastel hues. There are so many other ways one can infuse interesting design elements to create a candy-coloured home. 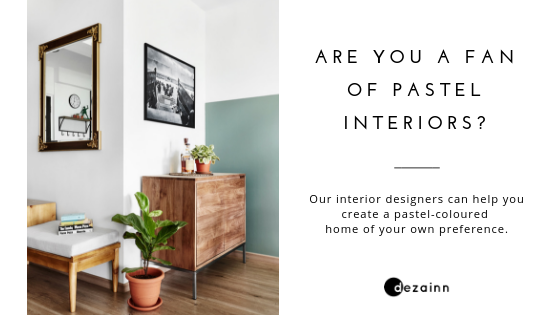 Get creative with our interior designers today!